The House of Commons is the lower house of the Parliament of the United Kingdom. Parliament also includes the Sovereign and the upper house, the House of Lords; the House of Commons is the dominant branch. The House of Commons is a democratically elected body, consisting of 646 members, who are known as "Members of Parliament" or MPs. Members are elected by the first-past-the-post system of election, holding office until Parliament is dissolved (a maximum of five years). Each member is elected by, and represents, an electoral district known as a constituency. The House of Commons is the source of the vast majority of government ministers and every Prime Minister since 1902, with the very brief exception of Sir Alec Douglas-Home in 1963, has been drawn from it (Home did actually rule from the House of Commons, however, taking a seat in the House shortly after being chosen as Prime Minister). The House of Commons evolved at some point during the fourteenth century and has been in continuous existence since. 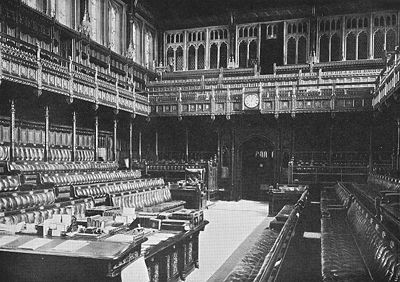 The House of Commons (the "lower house") was once far less powerful than the House of Lords (the "upper house"), but is now by far the dominant branch of Parliament. 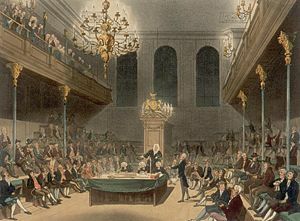 The House of Commons' legislative powers exceed those of the House of Lords; under the Parliament Act 1911, the Lords' power to reject most bills was reduced to a mere delaying power. Moreover, the Government of the United Kingdom is answerable to the House of Commons; the Prime Minister stays in office only as long as he or she retains the support of the lower house. The full, formal style and title of the House of Commons is The Honourable the Commons of the United Kingdom of Great Britain and Northern Ireland in Parliament assembled. The term "Commons" derives from the Norman French word communes, referring to the geographic and collective communities of their representatives. It is often misunderstood that "Commons" comes from the word "commoners," referring to those sitting in the House, similar to the way in which the name "House of Lords" indicates that those sitting in the "Other Place" are elevated to the Peerage. This explanation, however, is ahistorical. Both Houses, the Commons and Lords, meet in the Palace of Westminster. Both Houses have in the past met elsewhere, and retain the right to do so, provided the Mace is present. Parliament developed from the council that advised the monarch during medieval times. This royal council, meeting for short-term periods, included ecclesiastics, noblemen, as well as representatives of the counties (known as "knights of the shire"). The chief duty of the council was to approve taxes proposed by the Crown. In many cases, however, the council demanded the redress of the people's grievances before proceeding to vote on taxation. Thus, it developed legislative powers. In the "Model Parliament" of 1295, representatives of the boroughs (including towns and cities) were also admitted. Thus, it became settled practice that each county send two knights of the shire, and that each borough send two burgesses. At first, the burgesses were almost entirely powerless; while county representation was fixed, the monarch could enfranchise or disfranchise boroughs at pleasure. Any show of independence by burgesses would have led to the exclusion of their towns from Parliament. The knights of the shire were in a better position, though less powerful than their aristocratic counterparts in the still unicameral Parliament. The division of Parliament into two houses occurred during the reign of Edward III: The knights and burgesses formed the House of Commons, while the clergy and nobility became the House of Lords. Though they remained subordinate to both the Crown and the Lords, the Commons did act with increasing boldness. During the Good Parliament (1376), the Speaker of the House of Commons, Sir Peter de la Mare, complained of heavy taxes, demanded an accounting of the royal expenditures, and criticized the King's management of the military. The Commons even proceeded to impeach some of the King's ministers. The bold Speaker was imprisoned, but was soon released after the death of King Edward III. During the reign of the next monarch, Richard II, the Commons once again began to impeach errant ministers of the Crown. They insisted that they could not only control taxation, but also public expenditures. Despite such gains in authority, however, the Commons still remained much less powerful than the House of Lords and the Crown. The bitter differences between Charles I and Parliament were great, and were settled only by the English Civil War, in which the armed forces of Parliament were victorious. In December 1648 the House of Commons was purged by the New Model Army, which was supposed to be subservient to Parliament, in Pride's Purge, the first and only military coup in English history. This paved the way for King Charles I to be beheaded and for the Upper House to be abolished. The unicameral Parliament that remained, in which the Commons were theoretically supreme, was later referred to by critics as the Rump Parliament, seeing as it consisted of a small selection of Members of Parliament approved by the army–some of whom were soldiers themselves. When leading figures in this Parliament began to disagree with army leaders over various issues of government policy and how to hold new elections, this Parliament was dissolved by army leader Oliver Cromwell in 1653. However, the monarchy and the House of Lords were both restored along with the Commons in 1660, soon after Cromwell's death in 1658. The influence of the Crown had been lessened, and was further diminished when James II was deposed in the course of the Glorious Revolution (1688). The House of Commons in the early nineteenth century. The House of Commons experienced an important period of reform during the nineteenth century. The Crown had made use of its prerogative of enfranchising and disenfranchising boroughs very irregularly, and several anomalies had developed in borough representation. The constituency boundaries had not been changed sice 1660 so many towns that were once important but had become inconsiderable by the nineteenth century retained their ancient right of electing two Members each. The most notorious of these "rotten boroughs" were Old Sarum, which had only six voters for two MPs and Dunwich which had fallen into the sea; at the same time, large cities such as Manchester received no separate representation, although their eligible residents were able to vote in the corresponding county seat—in the case of Manchester, Lancashire. Also notable were the pocket boroughs, small constituencies controlled by wealthy landowners and aristocrats, whose "nominees" were invariably elected by the voters. The next important phase in the history of the House of Commons came during the early twentieth century. In 1908, the Liberal Government under Herbert Henry Asquith introduced a number of social welfare programs, which, together with an expensive arms race with Germany, had forced the Government to seek more funding in the form of tax increases. In 1909, the Chancellor of the Exchequer, David Lloyd George, introduced the "People's Budget," which proposed a new tax targeting wealthy landowners. The unpopular measure, however, failed in the heavily Conservative House of Lords. Having made the powers of the House of Lords a primary campaign issue, the Liberals were re-elected in January 1910. Asquith then proposed that the powers of the House of Lords be severely curtailed. Proceedings on the bill were briefly interrupted by the death of King Edward VII, but were soon recommenced under the new monarch, George V. After the election in December 1910 the Asquith Government secured the passage of a bill to curtail the powers of the House of Lords. The Prime Minister proposed, and the King agreed, that the House of Lords could be flooded by the creation of 500 new Liberal peers if it failed to pass the bill. (This was the same device used earlier to force the Upper House to consent to the passage of the Reform Act 1832.) The Parliament Act 1911 came into effect, destroying the legislative equality of the two Houses of Parliament. The House of Lords was permitted only to delay most legislation, for a maximum of three parliamentary sessions or two calendar years (reduced to two sessions or one year by the Parliament Act 1949). Since the passage of these Acts, the House of Commons has remained the dominant branch of Parliament, both in theory and in practice. Since the seventeenth century, MPs had been unpaid. Most of the men elected to the Commons had private incomes, while a few relied on financial support from a wealthy patron. Early Labour MPs were often provided with a salary by a trade union, but this was declared illegal by a House of Lords judgment of 1910. Consequently a clause was included in the Parliament Act 1911 introducing salaries for MPs. It should be noted, however, that government ministers had always been paid. Each Member of Parliament represents a single constituency. Prior to the reforms of the 19th century, the constituencies had little basis in population: The counties and the boroughs (whose boundaries were fixed) were, for the most part, represented by two Members each. Reforms enacted during the nineteenth century, starting with the Reform Act 1832, led to a more even distribution of seats. Moreover, the reforms of 1885 abolished most two-member constituencies; the few that remained were all abolished in 1948. University constituencies (the constituencies that allowed important universities such as Oxford, Cambridge and the ancient universities of Scotland to be represented in Parliament) were abolished in the same year. Thus, each constituency now elects only one Member of Parliament. There is still a technical distinction between county constituencies and borough constituencies, but the only effect of this difference involves the amount of money candidates are allowed to spend during campaigns. The term "Member of Parliament" is normally used only to refer to Members of the House of Commons, even though the House of Lords is also a part of Parliament. Members of the House of Commons may use the post-nominal letters "MP." The annual salary of each Member is £59,095; Members may receive additional salaries in right of other offices they hold (for instance, the Speakership). Most Members also claim between £100,000 and £150,000 for various office expenses (staff costs, postage, traveling, etc.) and also in the case of non-London Members for the costs of maintaining a home in London. There are numerous qualifications that apply to Members of Parliament. Most importantly, one must be aged at least 21, until S.17 of the Electoral Administration Act (2006) comes into force when it will be lowered to 18, and must be a citizen of the United Kingdom, of a British overseas territory, of the Republic of Ireland, or of a member of the Commonwealth of Nations, in order to be eligible. These restrictions were introduced by the British Nationality Act 1981, but were previously far more stringent: Under the Act of Settlement 1701, only natural-born subjects were qualified. Members of the House of Lords may not serve in the House of Commons, or even vote in parliamentary elections; however, they are permitted to sit in the chamber during debates. A person may not sit in the House of Commons if he or she is the subject of a Bankruptcy Restrictions Order (applicable in England and Wales only), or if he or she is adjudged bankrupt (in Northern Ireland), or if his or her estate is sequestered (in Scotland). Also, those judged mentally incompetent are ineligible to sit in the House of Commons. Under the Mental Health Act 1983, two specialists must report to the Speaker that a Member is suffering from mental illness before a seat can be declared vacant. There also exists a common law precedent from the eighteenth century that the "deaf and dumb" are ineligible to sit in the Lower House; this precedent, however, has not been tested in recent years, and is highly unlikely to be upheld by the courts. Jack Ashley continued to serve as an MP for 25 years after becoming profoundly deaf. Anyone found guilty of high treason may not sit in Parliament until he or she has either completed the term of imprisonment, or received a full pardon from the Crown. Moreover, anyone serving a prison sentence of one year or more is ineligible. Finally, the Representation of the People Act 1983 disqualifies for ten years those found guilty of certain election-related offenses. Several other disqualifications are established by the House of Commons Disqualification Act 1975. Holders of high judicial offices, civil servants, members of the regular armed forces, members of foreign legislatures (excluding members of the legislatures of the Republic of Ireland and Commonwealth countries), and holders of several Crown offices listed in the Act are all disqualified. The provisions of the House of Commons Disqualification Act 1975 largely consolidate the clauses of several previous enactments; in particular, several Crown officers had already been disqualified since the passage of the Act of Settlement 1701. Ministers, even though they are paid officers of the Crown, are not disqualified. The Clerk of the House is both the House's chief adviser on matters of procedure and Chief Executive of the House of Commons. He is a permanent official, not a Member of the House itself. The Clerk advises the Speaker on the rules and procedure of the House, signs orders and official communications, and signs and endorses bills. He chairs the Board of Management, which consists of the heads of the six departments of the House. The Clerk's deputy is known as the Clerk Assistant. Another officer of the House is the Serjeant-at-Arms, whose duties include the maintenance of law, order, and security on the House's premises. The Serjeant-at-Arms carries the ceremonial Mace, a symbol of the authority of the Crown and of the House of Commons, into the House each day in front of the Speaker. The Mace is laid upon the Table of the House of Commons during sittings. The Librarian is head of the House of Commons Library, the House's research and information arm. Like the House of Lords, the House of Commons meets in the Palace of Westminster in London. The Commons Chamber is small and modestly decorated in green, in contrast with the large, lavishly furnished red Lords Chamber. There are benches on two sides of the Chamber, divided by a center aisle. This arrangement reflects the design of St Stephen's Chapel, which served as the home of the House of Commons until destroyed by fire in 1834. The Speaker's chair is at one end of the Chamber; in front of it is the Table of the House, on which the Mace rests. The Clerks sit at one end of the Table, close to the Speaker so that they may advise him or her on procedure when necessary. Members of the Government sit on the benches on the Speaker's right, while members of the Opposition occupy the benches on the Speaker's left. In front of each set of benches, a red line is drawn on the carpet. The red lines in front of the two sets of benches are said to be two sword-lengths apart; a Member is traditionally not allowed to cross the line during debates, for he or she is then supposed to be able to attack an individual on the opposite side. This, however, is a picturesque fiction. Government ministers and important Opposition leaders sit on the front rows, and are known as "frontbenchers." Other Members of Parliament, in contrast, are known as "backbenchers." Oddly, all Members of Parliament cannot fit in the Chamber, which can seat only 427 of the 646 Members. Members who arrive late must stand near the entrance of the House if they wish to listen to debates. Sittings in the Chamber are held each day from Monday to Thursday, and also on some Fridays. During times of national emergency, the House may also sit at weekends. Following recent reforms, a duplicate House of Commons meets in another chamber (the former Grand Committee Room, off Westminster Hall) in the Palace of Westminster, Westminster Hall debates are generally uncontroversial or non-partisan; business which leads to actual votes must still be conducted in the main Chamber. Westminster Hall sittings take place each Tuesday, Wednesday and Thursday. On Wednesdays the sitting is suspended for a lunch break. Sittings are also suspended whenever there is a division taking place in the House itself. Sittings of the House are open to the public, but the House may at any time vote to sit in private, by the vote of a simple majority. (However, this has been done only twice since 1950.) Traditionally, a Member who desired that the House sit privately could shout "I spy strangers," and a vote would automatically follow. In the past, when relations between the Commons and the Crown were less than cordial, this procedure was used whenever the House wanted to keep its debate private. More often, however, this device was used to delay and disrupt proceedings; as a result, it was abolished in 1998. Now, Members seeking that the House sit in private must make a formal motion to that effect. Public debates are broadcast on the radio, and on television by BBC Parliament, and are recorded in Hansard. 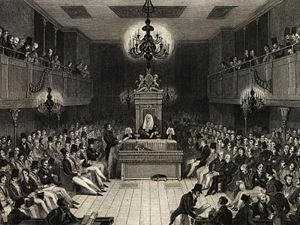 Sessions of the House of Commons have sometimes been disrupted by angry protesters who hurl objects into the Chamber from the Strangers Gallery and other galleries. Items which have been thrown into the House include leaflets, manure, flour (see Fathers 4 Justice House of Commons protest), and a canister of chlorobenzylidene malonitrile (tear gas). Even members have been known to disturb proceedings of the House; for instance, in 1976, Conservative MP Michael Heseltine seized and brandished the Mace of the House during a heated debate. Perhaps the most famous disruption of the House of Commons was caused by King Charles I, who entered the Commons Chamber in 1642 with an armed force in order to arrest five Members of Parliament—who belonged to an anti-royalist faction—for high treason. This action, however, was deemed a grave breach of the privilege of the House, and has given rise to the tradition that the monarch may not set foot in the House of Commons. Each year, the parliamentary session begins with the State Opening of Parliament, a ceremony in the Lords Chamber during which the Sovereign, in the presence of Members of both Houses, delivers an address on the Government's legislative agenda. The Gentleman Usher of the Black Rod (a Lords official) is responsible for summoning the Commons to the Lords Chamber; when he arrives to deliver his summons, the doors of the Commons Chamber are slammed shut in his face, symbolizing the right of the Lower House to debate without interference. The Gentleman Usher knocks on the door thrice with his Black Rod, and only then is he granted admittance. He then informs the MPs that the Monarch awaits them. Then they all go to the House of Lords for the Queen's Speech, with the exception of MPs, such as Dennis Skinner, who favor the abolition of the Lords and the monarchy. During debates, Members may speak only if called upon by the Speaker (or a Deputy Speaker, if the Speaker is not presiding). Traditionally, the presiding officer alternates between calling Members from the Government and Opposition. The Prime Minister, the Leader of the Opposition, and other leaders from both sides are normally given priority when more than one Member rises to speak at the same time. Formerly, all Privy Counsellors were granted priority; however, the modernization of Commons procedure led to the abolition of this tradition in 1998. The Standing Orders of the House of Commons do not establish any formal time limits for debates. The Speaker may, however, order a Member who persists in making a tediously repetitive or irrelevant speech to stop speaking. The time set aside for debate on a particular motion is, however, often limited by informal agreements between the parties. Debate may, however, be restricted by the passage of "Allocation of Time Motions," which are more commonly known as "Guillotine Motions." Alternatively, the House may put an immediate end to debate by passing a motion to invoke the Closure. The Speaker is allowed to deny the motion if he or she believes that it infringes upon the rights of the minority. Nowadays, Bills are scheduled according to a Timetable Motion, which the whole House agrees in advance, obviating use of the guillotine. When the debate concludes, or when the Closure is invoked, the motion in question is put to a vote. The House first votes by voice vote; the Speaker or Deputy Speaker puts the question, and Members respond either "Aye" (in favor of the motion) or "No" (against the motion). The presiding officer then announces the result of the voice vote, but if his or her assessment is challenged by any Member, a recorded vote known as a division follows. (The presiding officer, if he or she believes that the result of the voice vote is so clear that a division is not necessary, may reject the challenge.) When a division occurs, Members enter one of two lobbies (the "Aye" lobby or the "No" lobby) on either side of the Chamber, where their names are recorded by clerks. At each lobby are two Tellers (themselves Members of the House) who count the votes of the Members. Once the division concludes, the Tellers provide the results to the presiding officer, who then announces them to the House. If there is an equality of votes, the Speaker or Deputy Speaker has a casting vote. Traditionally, this casting vote is exercised to allow further debate, if this is possible, or otherwise to avoid a decision being taken without a majority (for example, voting No to a motion or the third reading of a bill). Ties rarely occur—the last one was in July 1993. The quorum of the House of Commons is 40 members for any vote; if fewer than 40 members have participated, the division is invalid. Formerly, if a Member sought to raise a point of order during a division, suggesting that some of the rules governing parliamentary procedure are violated, he was required to wear a hat, thereby signaling that he was not engaging in debate. Collapsible top hats were kept in the Chamber just for this purpose. This custom was discontinued in 1998. The outcome of most votes is largely known beforehand, since political parties normally instruct members on how to vote. A party normally entrusts some Members of Parliament, known as whips, with the task of ensuring that all party Members vote as desired. Members of Parliament do not tend to vote against such instructions, since those who do so are unlikely to reach higher political ranks in their parties. Errant Members may be deselected as official party candidates during future elections, and, in serious cases, may be expelled from their parties outright. Ministers, junior ministers and PPSes who vote against the whips' instructions are likely to lose their positions. Thus, the independence of Members of Parliament tends to be low, although "backbench rebellions" by Members discontent with their party's policies are not that rare. A member is also traditionally allowed some leeway if the interests of her/his constituency are adversely affected. In some circumstances, however, parties announce "free votes," allowing Members to vote as they please. Votes relating to issues of conscience such as abortion and capital punishment are typically free votes. Most bills were, until 2006, considered by Standing Committees, which consist of between 16 and 50 members each. The membership of each Standing Committee roughly reflected the standing of the parties in the whole House. Though "standing" may imply permanence, the membership of Standing Committees changed constantly; new Members were assigned each time the Committee considered a new bill. There was no formal limit on the number of Standing Committees, but usually only ten. Rarely, a bill was committed to a Special Standing Committee, which operated much like a Standing Committee, but also investigated and held hearings on the issues raised by the bill. In November 2006, Standing Committees were replaced by Public Bill Committees. The House of Commons also has several Departmental Select Committees. The membership of these bodies, like that of the Standing Committees, reflects the strength of the parties in the House of Commons. Each committee elects its own Chairman. The primary function of a Departmental Select Committee is to scrutinise and investigate the activities of a particular Government Department; to fulfill these aims, it is permitted to hold hearings and collect evidence. Bills may be referred to Departmental Select Committees, but such a procedure is very seldom used. Bills may be introduced in either House, though controversial bills normally originate in the House of Commons. Some always start in the other House, so as to equalize the parliamentary timetable. Hence, as the power of the House of Lords has been severely curtailed by statute and by practice, the House of Commons is clearly and by far the more powerful branch of Parliament. Although it does not elect the Prime Minister, the position of the parties in the House of Commons is of overriding importance. By convention the Prime Minister is answerable to, and must maintain the support of, the House of Commons. Thus, whenever the office of Prime Minister falls vacant, the Sovereign appoints the person most likely to command the support of the House– normally the leader of the largest party in the Lower House. (The leader of the second-largest party becomes the Leader of the Opposition.) In modern times, by convention, the Prime Minister is always a member of the House of Commons, rather than the House of Lords. In modern times, a vast majority of ministers belong to the Commons rather than the Lords. No major cabinet position (except Lord Privy Seal, Lord Chancellor and Leader of the House of Lords) has been filled by a Lord since Lord Carrington resigned as Foreign Secretary in 1982, though some of the middle rank Cabinet posts such as Defence Secretary and International Development Secretary have been filled by peers. The elected status of members of the Commons, as opposed to the unelected nature of members of the Lords, is seen to lend more legitimacy to ministers from the Commons. The Prime Minister chooses the Ministers, and may decide to remove them at any time; the formal appointment or dismissal, however, is made by the Sovereign. The House of Commons scrutinizes the Government through "Question Time," a period during which Members have the opportunity to ask questions of the Prime Minister and of other Cabinet Ministers. Prime Minister's Question Time occurs once each week, normally for a half-hour each Wednesday. Questions must relate to the responding Minister's official Government activities, not to his or her activities as a party leader or as a private Member of Parliament. Customarily, members of the Government party and members of the Opposition alternate when asking questions. In addition to questions asked orally during Question Time, Members of Parliament may also make inquiries in writing. In practice, the House of Commons' scrutiny of the Government is fairly weak. Since the first-past-the-post electoral system is employed in elections, the governing party tends to enjoy a large majority in the Commons; there is often limited need to compromise with other parties. Modern British political parties are so tightly organized that they leave relatively little room for free action by their MPs. Thus, during the 20th century the Government has lost confidence issues only thrice–twice in 1924, and once in 1979. However, the threat of rebellions by backbench MPs often forces Governments to make concessions to their cause (see top-up fees, foundation hospitals). Occasionally the Government is defeated by backbench rebellions (Terrorism Act 2006). However, the scrutiny provided by the Select Committees is more serious. 3 Clare Short, who resigned the Labour whip on 20 October, 2006. 5 Quentin Davies crossed the floor on 26 June, 2007 "Conservative MP defects to Labour", BBC News online. 6 Tony Blair resigned by taking the Stewardship of the Chiltern Hundreds on 27 June 2007. Mackenzie, K.R. The English Parliament Pelican Books, 1950. "Parliament." Encyclopædia Britannica, 11th ed. London: Cambridge University Press, 1911. Pollard, Albert F. The Evolution of Parliament, 2nd ed. London: Longmans, Green and Co., 1926. Porritt, Edward, and Annie G. Porritt. The Unreformed House of Commons: Parliamentary Representation before 1832. Augustus M Kelley Pubs, 1903. ISBN 9780678000120. The Parliament of the United Kingdom. History of "British House of Commons"
This page was last modified on 25 June 2016, at 16:26.